Achieving the desired results of a custom architectural millwork project requires the work of an expert—a professional with the right mix of skill and productivity to meet the demands and specifications of the design. Cabinetmakers and millworkers fabricate and install both decorative and functional elements, including trim and molding, cabinetry, ceiling treatments, doors, windows, exposed columns and beams, displays, mantels, staircases, and much more. Their skills focus on technology, including the proper operation of intricate machinery. It takes incredible skill to create the details and fine craftsmanship found in the woodwork, cabinetry and décor in commercial, residential, institutional and retail structures. "Achieving the desired results of a custom architectural millwork project requires the work of an expert"
UBC custom millwork professionals receive both classroom and hands-on training at state-of-the-art training centers around the country. Initial training for apprentices and skill enhancement courses for journeymen are taught by industry veterans or industry and manufacturer technical experts. Subjects range from basic skills to new technologies, tools, and/or installation methods. This comprehensive training translates into unmatched productivity by UBC members for their employers. 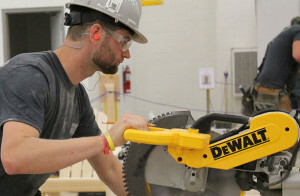 Safety—a top priority for every millwork contractor and their crews—is a constant element of training. Topics range from IHSA certifications, personal and tenant protection measures, containing contaminants, material handling, and more.